Our Keurig 2.0 started behaving weirdly a couple months ago, so we were keeping an eye out for replacements when I spotted this. We bought it, and I love it. 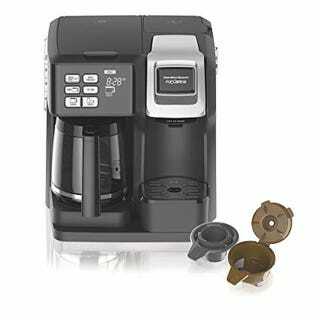 This is what Keurig machines should have been from the start: the ability to brew an entire pot, but the ability to use K-cups when you want a single cup. One of my pet peeves about the Keurig machines is that the water never seems to be hot enough except on the commercial models. On the FlexBrew it is perfect. Also, you add the water (up to 14 oz.) for each individual cup every time rather than a reservoir, so no de-scaling. Another good feature is that it can use K-cups, but it also comes with a little do-it-yourself K-cup with a bit higher capacity than some of the other DIY K-cups out there. I’m very happy with this thing. Plus we got it for $70 during the holidays, while I think I paid $130 for the 2.0 when we bought it.